Those recovering from addiction can be motivated by these insightful words from Carl Bard: “Though no one can go back and make a brand new start, anyone can start from now and make a brand new ending.” Your issues with drugs or alcohol do not have to shed a dark shadow over your entire life. You can bring new light into your life at any moment and that starts with the choice to change. Quitting is an important and necessary step for change, but there are other steps you must take to ensure your success—strengthening yourself both physically and mentally. Why? You may have been influenced to avoid substances due to the problems they caused in your life. You may have lost your job or your home, or your personal relationships may be fraying as a result of your addiction. While these are all great reasons to stop, few people realize just how much harm is done to the body during substance use. Some drugs cause constipation. Therefore, withdrawal may involve diarrhea, nausea, and vomiting. These gastrointestinal problems may result in nutrient deficiencies and electrolyte imbalances. As you can see, substance use has numerous detrimental effects on your health and well-being. However, in recovery, you can do something to actively improve your body’s functioning. Appropriate nutrition replenishes vitamin and nutrient deficiencies, rebuilds muscle stores, strengthens the immune system, and improves memory. The food you eat will help you feel stronger and more capable of staying on the wagon. Plus, well-balanced nutrition can help addicts combat withdrawal symptoms, too. 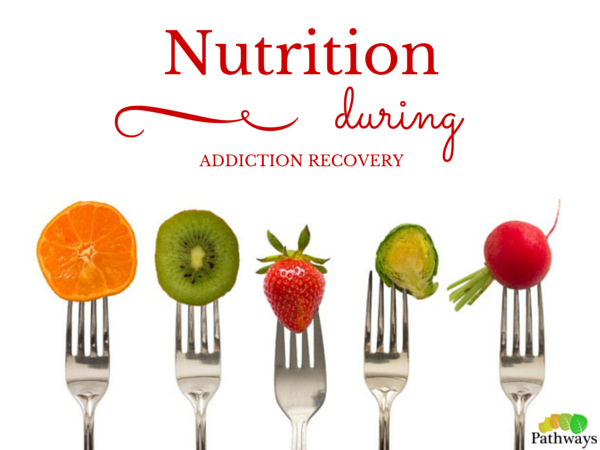 Nutritional therapy can be extremely beneficial during recovery. Many addicts believe that if they have made a commitment to quit drugs and alcohol, they should be able to indulge themselves in their diet. However, even on the road to recovery, you should be mindful of your daily eating habits as they can enhance your chances of long-term success. How? Proper diet and nutrients can resupply your body with what it needs to function optimally. Nutrition can improve various body tissues and organs to serve their primary purposes in keeping your body healthy. Plus, a balanced diet has been shown to improve mood and general health. As you eat better, you are more likely to feel better, too. As a result of your enhanced mood, you are more likely to remain in recovery and avoid relapse. A total diet revolution may be too much for someone who was once eating pizza, chips, and beer every day. Instead of making too many drastic changes, try to implement small changes to your diet over a span of weeks. Remember to take baby steps in your diet if you have never been accustomed to eating healthy. These changes can be difficult to make. If you attempt too much at once, you could end up giving up on all your healthy behaviors and retreating back to substances. Begin taking a multivitamin to supply your body with the vitamins and nutrients it has been lacking. Eat three regular, balanced meals per day that are low in fat, high in protein, and consisting of complex carbohydrates and fiber. Prevent dehydration by drinking water frequently throughout the day. If you do not prefer plain water, add lemon. Green tea is also a terrific beverage that provides numerous health benefits. If you have cravings, that is a sign that you should eat. Pack healthy snacks to enjoy throughout the day such as almonds or dried fruit. Many of those in addiction recovery turn from one culprit to another during recovery by getting addicted to sugar. Eating foods high in sugar provide a rush of energy and a spike in blood sugar. However, blood sugar quickly crashes leaving you craving more sugar. Avoid excessive sugar including foods loaded with refined and processed carbohydrates such as white breads, sodas, and pasta. In addition, minimize your caffeine consumption as it can be addictive as well. If you must drink coffee or tea, try drinking decaf or only enjoy one caffeinated serving per day. By implementing these changes into your daily routine, balanced nutrition can help you successfully recover from addiction. Your eating habits will help you build the foundation you need to feel stronger and more resilient. If you or someone you know is struggling with addiction, contact Pathways Real Life Recovery today for a free consultation. Click the image below for healthy eating recipes to get you going.